While in some regions, notably Hokkaido, railway lines that are considered unprofitable are being closed down, elsewhere there are attempts to keep them going. Such is the case for the Isumi Railway company, which maintains a 26.8 km stretch of line between Isumi and Kazusa Nakano, in Chiba Prefecture, to the east of Tokyo. 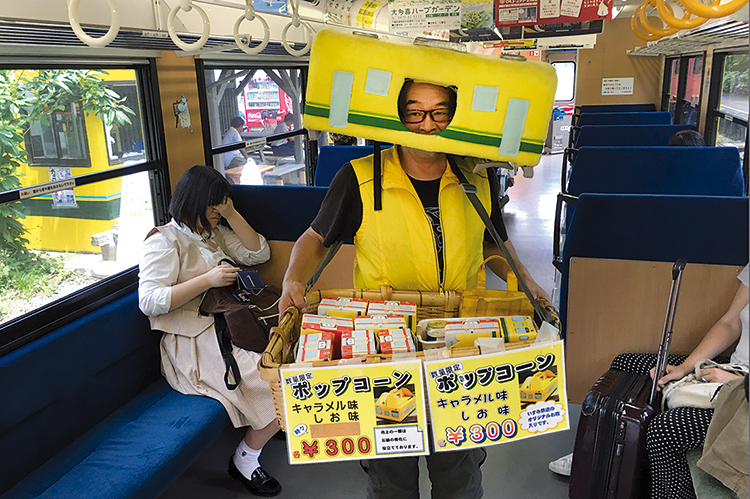 In order to survive and keep its trains running, it’s coming up with numerous original ideas such as the partnership set up in 2014 with the small Taiwanese railway line, Jiji, where this rather unusual pop-corn seller can be found. Household consumption fell again in April, for the third month in a row. The government is endeavouring to restore growth. Consumption has decreased by 1.3% in a year, after having already fallen by 0.7% in March and 0.9% in February. This sluggishness can be explained by anxiety about the future in a country with an ageing population, and the prospect of a large increase in welfare expenditure. Japan’s National Olympic Committee has set a target of 30 gold medals in the up-coming Tokyo Olympic Games in 2020. If this were to be achieved, it would be a historic Olympic record for the country. Up until now, it has never won more than 16 Olympic titles at a time, the total it gained at the Tokyo games in 1964, and at Athens in 2004. In Rio, in 2016, the number dropped to 16.